52-04-03 has been slow to mature, as one would expect from a cross like this. Tea hybrids usually are slow to build up size, and finally, at four years of age this one is showing its potential. It doesn't much like my climate, which isn't surprising, so I have budded it last year onto R. multiflora and will keep a specimen in the greenhouse where it will perform better. The photo is of that bud grafted specimen in a five gallon container, taken two days ago. This will be a warm climate hybrid, I expect, and in the right situation it will make a climber. How big it will ultimately get is anybody's guess at this point. I'm guessing modestly large: 8 to 10 feet, perhaps. This beautiful seedling bears clusters of nodding 3.5" blooms that open slowly and last a long time. In the open garden, the coloring is quite a bit richer with hints of antique gold. It has a moderate Tea fragrance that at 10 or 11 in the morning is quite wonderful. It has recently formed a new shoot from the base that has about 9 blooms forming on it, indicating that it may be capable of making bold displays. It is also nearly continuous with bloom, cycling rapidly. Sounds promising? I will begin propagating this a bit later on this season. It may require an understock to perform its best, we'll see. now and have been catalogued. I will post, with photos, soon. About working with R. wichurana hybrids. I have found that there is a trick to raising seedlings from this first generation R. wichurana hybrid. They don't like to be transplanted from flats to pots at an early stage, or they tend to roll over and die. See that fairly large seedling in the upper right? Thats about the size these have to get before they can be transplanted successfully. So if you are working with R. wichurana or any of its first generation hybrids, you may want to let these get to at least the three leaf stage before transplanting them. Oh, and one other thing: 0-47-19 has been my best hybrid for breeding Blackspot-free roses. 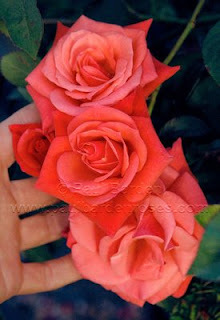 I consider it a very important rose in the search for disease-proof roses. 0-47-19 was the seed parent for my 2009 repeat blooming Rambler 'Mel's Heritage', which is something like a repeat blooming 'Cecile Brunner', but more lax in habit. Although people like Ralph Moore laid down the essential ground work for the modern mosses, it is still a difficult path to follow. Part of the problem is that you are adding another factor into the equation (all the other desirable traits + mossing) and so selecting for all of the qualities you want means you have even fewer seedlings to pick from. Fortunately there are some plants in my arsenal that makes the job a whole lot easier. Moore's 'Scarlet Moss' is one such rose. Not only does it pass on good mossing, with 'Dortmund' represented twice in its pedigree it readily passes on rich coloring. The seedling pictured here, 10-05-09 came out of a cross of 'Condoleezza' X ('Sequoia Ruby' X 'Scarlet Moss'). The pollen parent is a short plant with 2.5" very double cherry red blooms and moderate mossing, and is a sibling to my commercially available 'Unconditional Love'. The seed parent,'Condoleezza', a Ralph Moore mossy Floribunda, is a modestly mossed pink flowered shrub that often shows a bit of an orange/yellow center. 'Condoleezza' is one of my best seed setters. You can put any pollen on it and get seeds that germinate easily and soon after sowing. In this cross I was pleasantly surprised to discover not only some reds and deep pinks among the seedings, but this heavily mossed number that opens to bright, clear yellow semi-double blooms. (Two more photos here) There was also one very strong orange mossed seedling in this group which I will post about at some future date. 10-05-09 is a small shrub, not quite a miniature and not quite a Floribunda, about 2 X 2 feet and very full. It blooms in big clusters in flushes all season. Last year I stopped deadheading it and it formed seeds readily, so this year I plan on using it in breeding to see what it might do. I'm not entirely satisfied with the size of the plant; I'd rather have a full-sized bush with larger, fuller blooms. What about YOU, the reader? A request: I know several people are now reading my blog and a few have commented. Thats great, I hope there are extended discussions develop over time. But right now, if you would be so kind, would you let me know if you are enjoying the content I have been presenting? Are there things you'd rather see? Topics you'd like to hear about? Something about my experience I have unintentionally left out of these posts? I live in a fairly insular environment and I am sure I sometimes take certain things for granted about the people who read my writings. If thats been the case here, I'd like to know so I can broaden my scope and/or change direction some. So.....whaddaya say? PS: You do realize that you can click on the small photos in each post to see a full sized version, right? Seedling 105-04-08 is a cross of 'Sequoia Ruby' X "Magseed", the latter being a Ralph Moore rose I have mentioned before. Occasionally you get lucky. Case in point is this cross. Apparently "Magseed" has a lot of gravity of its own, because I got a number of seedlings that were clearly Rugosa influenced shrubs that grew quite tall and had 3.5" - 4.5" blooms. 105-04-08 is what I consider to be the best of the lot and it just gets better every year. It is fully fertile in both directions (I am using it in breeding extensively this year) and is easy to propagate from cuttings. It has also grown out in the test bed for four years now and is one of very few roses that is almost 100% resistant to Blackspot. Sounds good so far. Criticisms? Well, It is a bit upright and lacking branching as much as I'd like to see, so it takes a while to fill out as a shrub. (Based on the single original plant in the test garden. The large one in a pot in the breeding greenhouse is a lot fuller and shapely for some reason) It isn't quite as generous with bloom as I'd like it to be, but I hope to correct that in a next generation. Neither does it have much scent, but the color....WOW! 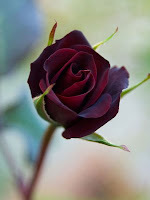 No photograph shows how rich and velvety the petals really are. 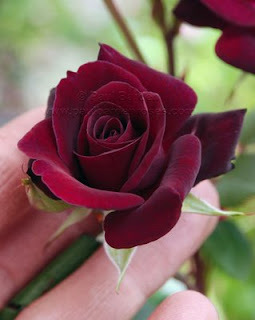 Its a magnificent color, starting out a deep garnet red and aging with violet-purple overlay on the outer petals. I expect to cross it back to some of the "purebred" Rugosas to see if the shrub habit can be improved, and maybe cross it with some Hybrid Musks to increase the volume of bloom. 'Trier' is capable of some serious magic so maybe I'll try that. Strong Tea scent. Yummm. Shrub character and vigor to be determined. Buds are bicolor cream and pink picotee. Towards immunity from disease: 'Home Run'? 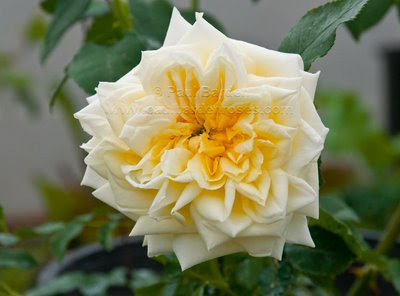 With the introduction of Bill Radler's 'Knockout' about ten years ago, hybridizers have placed greater emphasis on the creation of roses with greatly improved immunity to the typical diseases that trouble garden roses, namely Blackspot: Diplocarpon rosae. Its not an easy task; Blackspot resistance is complicated and may involve multiple genes to accomplish. Of course, it IS possible, but a breeder can easily take ten years or more to achieve reasonable results. Fortunately for many of us, the groundwork has been done by several breeders and we have several lines of hybrids we can incorporate into our work. One of the roses I am working with that I have found to impart superior Blackspot (and often Mildew) resistance is Ralph Moore's 0-47-19, the old R. wichurana X 'Floradora' hybrid. However, it tends to breed a lot of pinks and whites, which has so far been a rather limiting factor. More recently I acquired Tom Carruth's shrub 'Home Run', bred from 'Knockout' and involving 'Baby Love' as a grandparent. The latter is a five-petaled yellow shrub rose that is often used in breeding for disease resistance. Like its pollen parent 'Knockout', 'Home Run' is a triploid and only somewhat fertile. Its pollen will take on a limited number of plants and seeds are frequently infertile. However, in 2007 I made a successful cross of the old red Hybrid Tea 'Roundelay' X 'Home Run'. Why 'Roundelay', you ask? Well, here in my cliate it is immune to Blackspot even when not treated with fungicide. 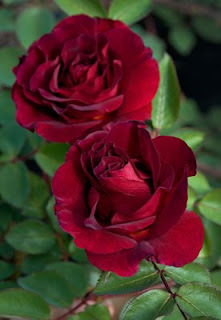 It is a shapely shrub of about 4 X 4 feet and blooms in clusters of deep garnet red 4" blooms. It does have some fragrance, but not very strong to my nose. Mainly, the Blackspot resistance was the thing that appealed to me most. As usual, there were very few seeds from the cross, and even fewer seedlings. Two survived by the end of the season and were in fact growing very strongly and making an impression on me. The best of the two is the seedling pictured here. (Photographed April 20, 2009) This seedling has dark red tinged green foliage that is quite large and very healthy so far. The plant branches freely from the base and blooms in clusters, much like its seed parent. The photo does not do the bloom justice; it is a dark black-garnet red much like 'Black Jade' at its very best. 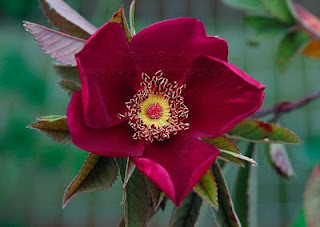 From a beautifully scrolled bud it opens to a slightly cupped, 12 petaled bloom about 3 inches across. There is a modest fragrance that I detect. I will propagate this from cuttings and by budding this year to multiply the plant and to evaluate its ease of propagation. Now the deal is to find out just how disease resistant it (and its sibling) really is. I've been talking a few times recently about the results I am getting using Ralph Moore's breeder "Magseed", so I think its time I spoke a bit about it in more detail. This is a sister seedling to 'Linda Campbell', ('Anytime' X 'Rugosa Magnifica') the remarkable Hybrid Rugosa that can be grown to perfection in almost any climate. It is reported to prosper in zones as cold as USDA 4, and is probably good to zone 3 in a protected location. 'Linda Campbell' is however, sterile. Most first generation Rugosa hybrids are. 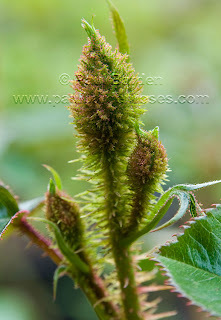 (I regard 'Rugosa Magnifica' as a "pure" Rugosa, and that would make 'Linda Campbell' the first outcrossing into a very different line of breeding) "Magseed" on the other hand is quite fertile. As its name suggests, it does produce seeds, but it is far more fertile as a male (pollen) parent. It tends to make one or two seeds per hip, so unless you have a very large, mature specimen, work with it as a seed bearer is going to be very slow. Better to use it for pollen and work with a generous seed bearer. I firmly believe that ideally, you should look at no less than 100 seedlings from any one cross to see the full breadth of what that cross can represent. Of course, you don't always get that opportunity; I make some crosses every year that result in hundreds of seeds, and then only five germinate. Bad combination of genes; can't always be avoided. I will make a few crosses using "Magseed" as the seed bearer, but the majority of crosses will employ it as a pollen donor. I think "Magseed" has the potential to breed a new race of hybrids that offer excellent shrub architecture (very important to me), improved Winter hardiness and hopefully, immunity to Blackspot, the bane of Rosedom. Rosa foliolosa is one of the native North American species. It has somewhat feathery foliage and small, deep pink blooms. It is a pretty species but unremarkable, at least until you use it in breeding. R. foliolosa is an odd one. It has been used twice in combination with R. rugosa to produce 'Ann Endt' and 'Basye's Purple', and once with 'Hansa' to produce 'Purple Springs'. I used it once about 7 years ago, on an impulse, by putting pollen of 'Little Chief' on my R. foliolosa. I don't recall exactly how many seedlings resulted, but four were kept in the end: two very dwarf plants with tiny foliage and 3/4" double pink blooms, a 3 foot shrub with larger foliage and 2" bright red semi-double blooms (more about this one later) and one that looked remarkably like 'Basye's Purple'. It appears that you can use R. foliolosa in combination with a variety of other roses and you will end up with some seedlings that look like 'Basye's Purple'. The seedling pictured here has similar bloom color, similar feathery foliage and growth habit (minus the suckering) and the same crimson pigmenting inside the canes. It reblooms several times in the growing season and has some scent. Unlike 'Basye's Purple' though, this seedling sets seed easily. I've never used it in breeding till now and I am waiting to see if its open pollinated seeds germinate. (I sowed these rather late) Who knows, maybe this will be a useful link in breeding Winter hardy shrubs with improved disease immunity. "Tusc-o-jam", the rose pictured in my blog banner. About 13 years ago I started down a tedious road to what I hoped would be the production of some Gallica-based remontant shrub roses. As all hybridizers do, I started with what I had on hand; a very limited selection. 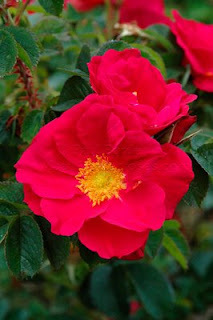 'Tuscany Superb' was an obvious choice because it represented an ideal: rich color, a growth habit I liked, ease of culture and exceedingly good health. To introduce genes for repeat bloom, I turned to what I now regard as a far less optimal choice: 'Othello', a David Austin red. 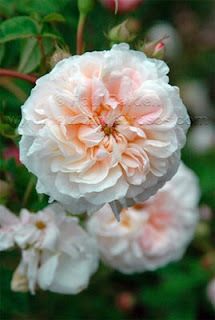 Still, you have to start somewhere, and 'Othello' did offer some features I wanted, such as its exceptional fragrance. The resulting seedlings (about 8 of 'em) varied from downright hideous to quite beautiful. One of these eventually was named 'Ellen Tofflemire' and is available in comerce. Several of the seedlings bloomed very dark but had problems opening. Some never opened their blooms at all, and these were trashed promptly. One other sibling still exists in a corner of my garden; a 12 petaled medium reddish (read: muddy crimson/red) Gallica that I used in breeding one more step towards the shrub type I was seeking. This Gallica, nicknamed simply "Tusc-oth" was crossed with the beautiful dark Hybrid Perpetual 'Souvenir du Dr. Jamain' and a handful of seedlings resulted. Ultimately only one was kept and this is the seedling illustrated here. "Tusc-o-jam" is a reasonably strong shrub that will grow to 8 feet easily, with arching canes that give it a graceful natural form. It is Spring blooming only, with bicolored deep lavender-pink deeply cupped blossoms showing a paler reverse. It has a rich Myrrh scent that some people think is more like Licorice. Not everyone finds that scent attractive. I think it is very curious that the Myrrh scent has come spontaneously out of a breeding line that (to the best of my knowledge) doesn't involved 'Ayreshire Splendens' which has often been held responsible for generating that scent. It is my experience that the Myrrh scent can surface in any crosses involving Gallicas in combination with modern shrubs. It is pollen fertile only but the pollen results in seed from most any seed setter. A portion of the offspring (approx. 50%) are remontant. I have not done a lot of work with this in breeding but one hybrid, 'Siren's Keep' is the result of a cross involving "Tusc-o-jam". This Spring I am going to be evaluating a couple of new crosses in which it has been used. If there's something to report, you'll find out about it here! L83 is listed as a Hybrid kordesii, created at the Canadian Experimental Agriculture Farm (aka AgCan) circa 1988. Its parentage is listed as R. kordesii X a 'Max Graf' derivative. This makes it a combination of only two species: R. wichurana and R. rugosa. Pollen available during the Spring blooming season, submit a comment if you want any. This seedling is the sole surviving seedling from a cross made in 2002 between 'Sequoia Ruby' and the magnificent old climbing Hybrid Tea 'Guinée', bred by Charles Mallerin in 1938. The idea behind this cross was to increase bloom production and frequency ('Guinée' is not very generous with bloom) while preserving the rich crimson of 'Guinée'. To be expected, the fragrance of 'Guinée' was lost, but this seedling accomplished some of the other goals, namely the deep coloring and the improved rate of repeat. While I'm sure there were other seedlings from this cross, I don't recall what any of them looked like and ultimately this was the only one saved. A few days ago I spoke about a seedling I am using in my work called "Joyseed", a cross of 'Joycie' and the Ralph Moore Rugosa hybrid "Magseed". I had mentioned how "Joyseed" was passing on traits like good coloring, attractive growth habit, etc. Well, here is an example of the kind of shrub "Joyseed" is breeding. Meet 31-06-05, a cross of 'Lilian Austin' X "Joyseed". 31-06-05 is still a young plant in a large container and is very early in the evaluation process. 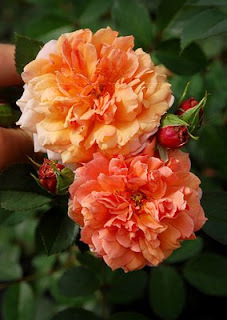 It blooms freely in clusters, with medium sized fully double blooms in a blend of yellow, orange and pink, making for a very pleasant color blend. It tends to be more pink when the Summer heat is on. It doesn't have a lot of fragrance unfortunately, but it does have an excellent shrub architecture, making a rounded, balanced shrub that looks like it will remain shapely without the need for a lot of "secateurial intervention". (IE: pruning) I will be using it in breeding this season (Spring 2009) as it showed last year that it sets seed readily. You can see another photo of 31-06-05 at HelpMeFind. All photographs displayed here in my blog are copyrighted and are not to be copied and/or published in any form without my express permission. All artists who publish work on the Internet have the right to choose how their work is displayed and used. Thank you for respecting my rights as a photographic artist. The seeds they are a-sproutin! Its that time of year; the seeds are germinating and I am starting to pot them up this week. Unfortunately mice are a serious problem where I am and so rose seeds must be sown in flats that are kept in a wire mesh "cage". Otherwise, the mice would sniff out the seeds, dig them up and eat them all. Yes, I've seen it happen. Thats why I do it the way I do now! At left is a photo of some of the first seedlings that came up about four weeks ago. The cross is 'Rosy Purple', a Louis Lens Hybrid Musk X 'Vineyard Song', a Ralph Moore shrub that is very Musk-like in character. In my garden, both of these are almost completely disease free (the former is 100% Blackspot free, the later nearly so) and so I hope I might obtain some compact, highly scented, disease free shrubs that bloom in big clusters. 'Rosy Purple' often produces panicles of over 100 blooms all over the shrub. I don't know why this isn't a more popular rose; it is nearly an ideal garden shrub, especially since it is so disease free. Referred to by its creator Ralph Moore as simply "OM", "Orange Moss" was a breakthrough hybrid in the breeding of modern Moss roses. It was created by crossing 'Mark Sullivan' a brightly colored Hybrid Tea, with Pedro Dot's 'Golden Moss'.When an undisclosed Hybrid Tea was pollinated with "OM", Moore obtained 44-59-4. He then crossed 'Rumba' with 44-59-4 and got his well known Floribunda Moss 'Goldmoss'. From here Ralph Moore went on to create several very attractive and very mossy miniatures in the yellow/orange color range by putting 'Goldmoss's pollen on 'Fairy Moss'. Very little along these lines has been done by other breeders, which is somewhat surprising. There has been renewed interest in mossed roses in the past decade as people are rediscovering the old moss varieties from the 1800's and early 1900's. I know a few amateur hybridizers are now doing some work with the Moore moss hybrids, myself included. For me, the more interesting varieties are the ones that preceed the introduction of the miniaturism genes, and so I am going all the way back to "OM" to do some work. Breeding "OM" presents some challenges: it tends to breed tall/climbing once blooming shrubs, and fertility may be a problem in moving forward. However, I think that since there are now so many new avenues to pursue that were not possible 40 years ago, it is worthwhile resurrecting plants like "OM" to see what else is possible using new, better parents. Last year I made two exploratory crosses using two very highly fertile orange/yellow breeders: 'Golden Angel' and 'Joycie'. The former I chose because it has a track record of breeding mossed progeny when a mossed pollen parent is used, and the latter because it is so very fertile and is easily influenced by the pollen parent. 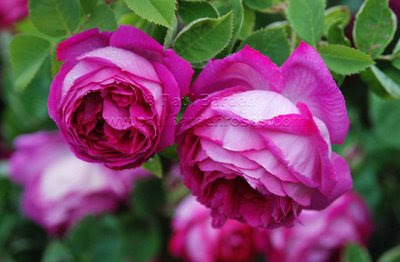 'Joycie' also has a habit of passing on strong, clear coloring, which is a plus. At the time of this writing I have several dozen seedlings from each of these crosses and will hopefully start to see some blooms in the next 4 to 6 weeks. I hope to be able to select a few full sized, mossed shrubs from these seedlings, and with any luck at all, some will be brightly colored. I will post pictures of anything I select. If these turn out to be total failures I will post a followup to that effect as well. 'Fortune's Double Yellow' is a very old Hybrid Gigantea brought from China circa 1845 by the explorer Robert Fortune. (One account documents its appearance in Europe under the name 'Rosa pseud-indica' pre-1820 when John Lindley included it under than name in his "Monograph of Roses" in 1820. It is entirely possible that it had been brought into European horticulture prior to Robert Fortune's introduction of it. We can never be certain of some of these details.) This is a very large climbing rose of massive stature. My first encounter with it was in Fresno, CA in 1999 where I found a specimen of it climbing a utility pole/fence where it had reached well over 25 feet tall and was at least 40 feet wide. It blooms in one brilliant display in the Spring, with masses of yellow/orange and pink tinted cupped blooms about 4" across. It has a very pleasant scent. This is a tender cultivar that doesn't take kindly to the cold, although I know people who grow it successfully as a modest sized shrub in zones as cold as USDA 6. In 2006 I obtained pollen of 'Fortune's Double Yellow' from some friends in California (my plant was languishing in my open garden at the time; it has been rescued since) and I pollinated the orange miniature 'Joycie' with it. From these seeds I obtained 19 seedlings. None bloomed in their first year, which was no surprise. In Spring of 2008, three of these one year old plants flowered, sparingly; a very double Tea-like medium pink bloom about 1.5" across, a five-petaled deep orange with a yellow eye, and a large flowered deep pink that aged to a dusky lavender with greysih tints. None of these had significant fragrance. The large pink one was moved up into a five gallon can and grew like a proverbial weed, making a few 7 foot canes in one season. It is now poised to bloom, with clusters of buds at every node along the canes, just like its pollen parent 'Fortune's Double Yellow'. Now, in April 2009, fifteen of these seedlings are set to flower. Some will bnear only one or two blooms and others have quite a few. Most of these will be blooming for the first time. The photo above depicts the buds of two of the first bloomers showing color through the sepals. These clearly have significant pigmentation, as predicted. While few, if any of these seedlings will have merit as a "finished product", I hope they have sufficient fertility to move ahead into a next generation of breeding. *crosses fingers* (This is an appealing idea since all of our modern yellow roses get their genes for yellow from R. foetida, a species that also contributed susceptibility to the fungal disease Blackspot. Perhaps this new avenue will help in overcoming some of the flaws in modern shrub roses?) Finally, after all these years, 'Fortune's Double Yellow' may get a chance to contribute its yellow genes to the breeding of a new race of richly colored hybrids. I hate to think of all the decent seedlings I may have dispatched to the compost heap in the past decade. The thing is that you have to make a choice to keep or discard based on moment to moment evaluations. A few bad evaluations in a row and that seedling is gone. 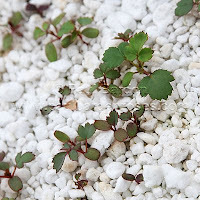 I have no doubt that I have thrown out plants that may have eventually matured into decent plants, but there is a limit to how many seedlings you can permit to reach maturity. Its just not possible unless you have unlimited space and resources. Ah well. And then there is the occasional seedling that gets put out onto a plot for testing and stays there for years, never quite cared for as it should be, but occasionally you wander by to take a peek. The rose at left is one such seedling. Probably bred circa 2001 it is a cross of 'Duchesse de Montebello' X 'Buff Beauty'. It blooms only for a few weeks in late Spring, and it is a bit of a tall, sprawly shrub, but it is beautiful, generous with flowers and it smells wonderful. It never gets sprayed with Fungicides and yet it is disease free. The bottom line is that there is little room in the Rose market for a variety like this; we don't need any more blush pink once-bloomers. And so, it remains in my test garden, up to its waist in weeds and species Lupins, and once or twice each Spring I wander past to say hello and inhale its rich Honey-like perfume. And then its back to the greenhouse to browse the new seedlings and decide who gets potted up and who goes on the compost heap. The Pollen parent, indicated by the contents of the brackets, is a breeder given to me by the accomplished California hybridizer Ralph Moore. 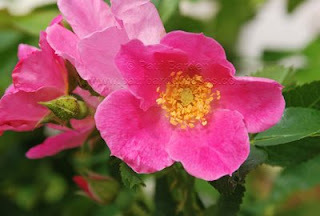 It is a sister seedling to 'Linda Campbell', an outstanding Hybrid Rugosa shrub, and unlike 'Linda Campbell' it is fully fertile both as a female or a male. Ralph's nickname for this plant is "Magseed" and that is how I generally refer to it as well. "Magseed'" was released in commerce in Europe by Meilland but was never made available here in the US. Why, I do not know. 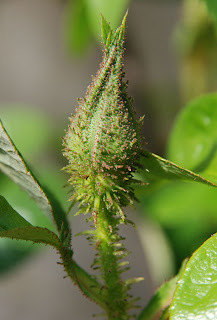 "Joyseed" shows little of the Rugosa character in its shrub habit, foliage and bloom, but I have seen evidence that some of the Rugosa traits reappear in its progeny. I have one seedling from 'Lilian Austin' X "Joyseed" that has some Rugosa foliage traits and a branching/flowering habit that is clearly influenced by Rugosa. My work so far with "Joyseed' has been limited but I will be stepping up my use of it this year, since some of the seedlings from '06 and '07 have been very promising. Good color intensity in the orange/yellow blend range. Excellent shrub habit; full and rounded, with abundant foilage. There is evidence that it can breed fragrant offspring, but this is not its strong suit. Good scent is likely quite possible with selection of the right parent. I am willing to distribute pollen of "Joyseed" to breeders who wish to incorporate it in their work. Welcome to the Paul Barden Roses blog. After maintaining Paul Barden Roses, a broadly inclusive rose web site for over a decade, I found the task of maintaining it had become tedious and difficult to keep up with, and so my web site went fallow in 2007. It persists as an archive of a considerable amount of information amassed over the years, including significant contributions from many renowned authors in the rose world. One of the greatest challenges I faced in recent years was the issue of image theft from my site. As a semi-retired professional photographer, I know the value of an original photograph and to have some of my best images taken again and again without my permission became discouraging. It was specifically this problem that led to the cessation of any new work being published there. While I do have plans to revise and update my original site, I have also chosen to divert some of my energy into this new Blog, which will be specifically about documenting and discussing the advances made in my breeding program. I plan on discussing the pedigree of individual plants I work with, show photos (properly watermarked for IP protection, of course) and opening up discussion on any topic related to the hybridizing of roses. I hope you find this discussion entertaining and perhaps even enlightening.